This month’s USA Judo Scholastic Championships include qualification to the 2011 cadet World Team that will compete at the Cadet World Championships in Kiev, Ukraine this August, an event that will include judoka from over 150countries. 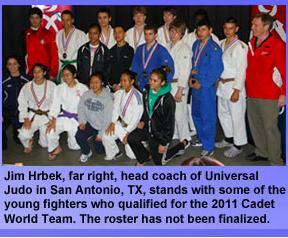 This entry was posted on April 18, 2011 at 6:00 am and is filed under Judo News. You can follow any responses to this entry through the RSS 2.0 feed. You can leave a response, or trackback from your own site.